How Do I Change Humidity? The best indoor air humidity monitors are the reliable method for controlling the dryness in your home regulating the amount of humidity at your desired level for comfort and health. The clouds rolling in are full of moisture known as humidity. I’m from a Rocky Mountain state where it is always dry, so I don’t like humidity that is relatively high in the Midwest and South in the USA. You might love humidity. Plants and trees grow like weeds with humidity and that’s why they are so lush and green. The arid areas where you only see cactus, brush, and a few trees such as cottonwood and willows indigenous to the areas are usually found near water and streams. Your hair might suffer from dryness outdoors and inside your home too when humidity is too low. Your sinuses, nose, and throat might even be dry. You can control the humidity levels in your home with several instruments to regulate it with your furnace running in the winter and your air conditioner working in the summer to keep you cool that also dries out the air. It’s an inexpensive fix and the indoor thermometer and humidity gauges are available on Amazon.com®. Read my indoor humidity monitor and indoor humidity meter reviews below to find the perfect one for your needs. An indoor humidity monitor not only lets you set your humidity level in percent, the instrument also has a temperature control for you to regulate simultaneously. Since you cannot control nature’s humidity outdoors, there is no device made to change it; however, there are units available to show you the outdoor humidity level that many of us like to know. The tool for measuring and controlling humidity is known as a humidistat and/or hygrometer and thermometer. You can use them to know your levels inside your home only. With the use of a humidifier, you can now control your humidity level. The amount of water, or moisture in the air is known as humidity and the relative humidity is measured in percent. The healthiest humidity is between 30% and 50% humidity while other experts tell us 40% to 60%. The advantages are dewy skin, paper, wallpaper, musical instruments and wood furniture and floors staying at a proper level to not dry out and become ruined. Your mucous membranes are moist, and your throat is not dry, plus your hands and nails are nice with moisture. For disadvantages, you might have dry nose and sinus membranes, split skin around your nails and cuticles, flyaway hair, static electricity on your clothes and door knobs that will give you a slight jolting shock but not harmful. Papers and wood can dry out so the right amount of moisture for having it both ways—not too dry and not too moist are your choices for what you buy. Very dry air and conversely, very low humidity in the air are likewise unfavorable to your overall health and comfort. The foremost areas are your skin and respiratory system. The reasons are twofold: Gas forced air furnaces running all winter indeed dry out the air. With some climates already dry, the interior of homes will be even drier. Humidity can be as low as 2- to 20% in winter and summer in dry desert or semi-arid environments. When running your air conditioner in late spring, summer, and early fall when it’s so hot, you can use a humidifier to offset that dryness by adding moisture to your home. For more information, please read here for features, design, and more exceptional products. Hygrometers measure the relative humidity in the air and it needs to know the temperature of the room to give the measurement. They can be manually operated with a knob or digitally control with buttons. Humidistats regulate the relative humidity in the air. You set the device to the level you want your moisture to be and it does it for you without you needing to guess what it is. You can buy them as one unit for knowing relative humidity and temperature in centigrade or Fahrenheit. Most of the best room humidifiers will have a humidistat to regulate the humidity in your house at Amazon.com® at affordable prices. Now that you have your gauges, they will tell you the humidity and temperature, yes. However, you cannot change the humidity if you do not have a humidifier or dehumidifier. You will need a unit to put humidity (moisture) into the air or a unit to remove moisture (humidity) from the air. 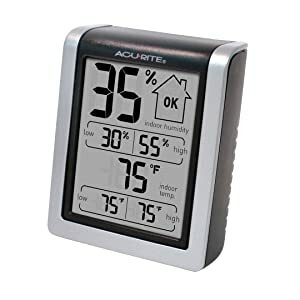 The AcuRite® digital home monitor, model number 00613 on Amazon.com® is inexpensive and does just what the higher priced models do for less cost to you. The humidity monitor with indoor thermometer, digital hygrometer, and humidity gauge indicator is accurate to place on your wall or sit like a picture frame with its back attachment. Controlling your humidity keeps away mold, viruses, bacteria, mites, and other allergens that harm your health. When you have a musky home odor, your humidity is too high. At a quick glance, you will know your relative humidity level inside and temperature for the correct feel you like. Being portable, take it with you in your camper or tent when having your camping adventures in the woods or by the lake. Have your daily high and low temperature and humidity records. It is wireless for putting on your mantel or furniture top. Read your temperature in F. or C. The control front is not back lit. It has no date/time stamp. Gift-wrapping is available, and you will receive the digital thermometer with hygrometer, instruction manual with a 1-year Limited Warranty. It is made in China. AcuRite® 00613 indoor humidity monitor review video. The ThermoPro model number TP55 digital hygrometer indoor thermometer humidity gauge with jumbo touchscreen and backlight temperature humidity monitor is a top selling unit on Amazon.com® that is affordable and is wireless. It is easy to use, comes with 2 each AAA batteries that last a long time and are easy to change with new ones. The back light does not stay on continuously. Push the button; this saves battery life. It has no date/time stamp. The screen is 4-inches and is backlit to read in the dark. It will update your readings every 10-minutes. It also shows you the dry/comfort/wet levels for you to know and adjust accordingly. The humidity reading confirms to you the correct humidity level that you want it set at for skin and other body dry areas. The unit runs and controls 24/7 and shows you the trends of each reading so you can adjust. Put it on your table top, mantel, or mount to the wall for the most accuracy. It reads out in F. or C. with large digits. 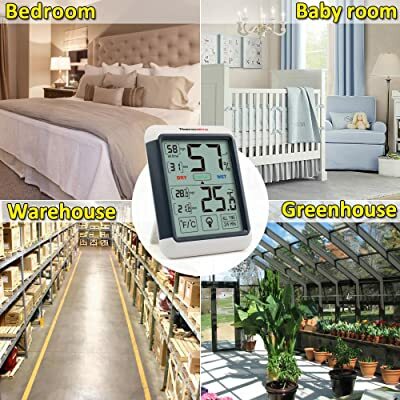 Keep your warehouse at the correct temperature and humidity, know your greenhouse humidity levels at a glance, and put one in your living room or child’s room. The dimensions are 4.3-inches tall x 3.3-inches wide x 1 -inch thick weighing 2.72-ounces. Gift-wrapping is available, and you will receive a User’s Manual with a 1-year Limited Warranty. It is made in China. ThermoPro Digital Humidity Temperature Monitor video. 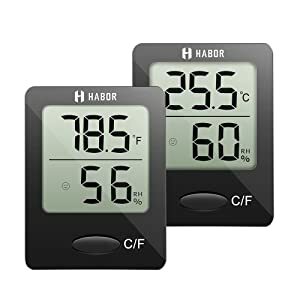 The Habor digital indoor humidity monitor item model number HBHM171AB is the latest and newest model from Habor on Amazon.com®. You will get two units to put in different rooms. Put one in your baby’s nursery, the living room, or in your music room if you have one. The gauge measures 1.8-inches wide x 2.3-inches tall x 0.7-inches thick, so will easily fit anywhere with a magnet to the fridge or other metal. You can also place it on any surface with its standing tab in the back. For indoor monitoring of your humidity and temperature, this hygrometer thermometer is ideal to prevent colds, asthma, flu, and germs from humidity that is too high and is one of the most accurate indoor hygrometers made. With 24 vent sensors, you will know your readings every 10-seconds. Switch from F. to C. for the way you understand temperature. Myself, I use Fahrenheit since Celsius was not used much in the USA. The LCD display panel is easy to see with large numbers and is not backlit. No problems reading because numbers are big. The icons show comfortable/uncomfortable/normal conditions. The device is made of strong ABS (Acetyl Butylene Styrene) plastic. This new model unit uses a lithium-ion round battery, CR2032 and it is included lasting about 6-months. Be sure to pull out the plastic tab that covers the battery for the unit to work and remove the plastic film from the front. The SensorPush® unit uses mobile apps with optional SensorPush® G1 Wi-Fi Gateway for providing monitoring temperature and humidity conditions and is sold separately. 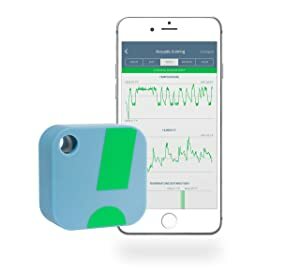 This gives you data and alerts via the Internet. The item model number HT1 shown on Amazon.com® is a great seller. Use with your iPhone®, Apple iOS®, or Android®. The Swiss-made sensors are accurate and pushes the readings to devices via Bluetooth® 4.0 and lets you know of any problems. The range with no obstructions for it to read is up to 325-feet. You will be alerted with any range problems without looking to check. Collect your data at 1-minute intervals that is stored over 2-weeks. Stored for analysis and graphing, you will have your mobile apps when within range. Monitor your humidity level and temperature for your home, refrigerator, guitar, cigar case, piano, wine, art, and even your greenhouse. You can put the device in your refrigerator to monitor the humidity and temperature as well. The unit is not waterproof or water resistant, but if the hole is kept on the bottom side, water cannot enter. Compatibility: iOS 8+, Android 4.3+. Requires Bluetooth 4.0+ (also known as Bluetooth LE). SensorPush® Wireless Thermometer and Humidity video. Remove the plastic film over the screen so you don’t think it’s scratched. These units do not need calibration; they are calibrated at the factory. Remove the plastic tab at the battery door so the unit will start working. These units are not waterproof or water resistant so do not submerge in water. The units listed are not outdoor thermometers. They can show you the outdoor humidity and temperature levels but are not made to withstand rain. Stay healthy and protect your valuables by controlling the humidity in your home or other places. Happy shopping!